(Asheville, NC) – Sometimes a beer starts with inspiration outside the beer. 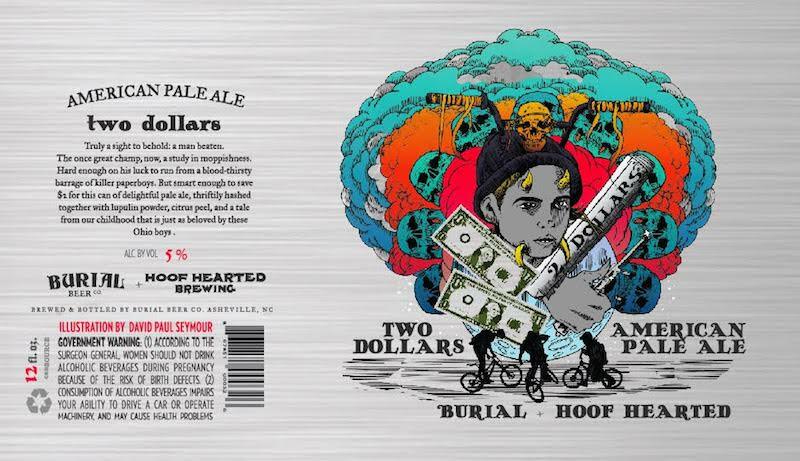 Sharing a mutual love for one of the 80s best films, and the heathen child that haunts it, we decided to offer a beer in the taproom for just $2. To do so, we pulled from fiscally-responsible influences beyond your what is in your typical pale ale, enlisting coriander and lime peel to provide a sharp, summery spice reminiscent of our favorite farmhouse ales. We also employ a modest dry hop featuring lupulin powder and an expressive yeast to provide even more oomph. Our modern Gose is soured the hard way, using oak barrels to age the beer on our house lactobacillus. Brewed with our own blend of sea salts, this sea worthy vessel is christened with Hibiscus and rose hips imparting floral notes and a sunrise rose hue. A blade for many a pocket, this IPA displays malt in its most elemental form: Pilsner, Oats, and locally grown and malted rye. Mosaic, El Dorado, and Galaxy hops present a sharp, citrus punch while the addition of Simcoe to the dry hop adds a final piney complexity to this easy sipping hazy IPA.